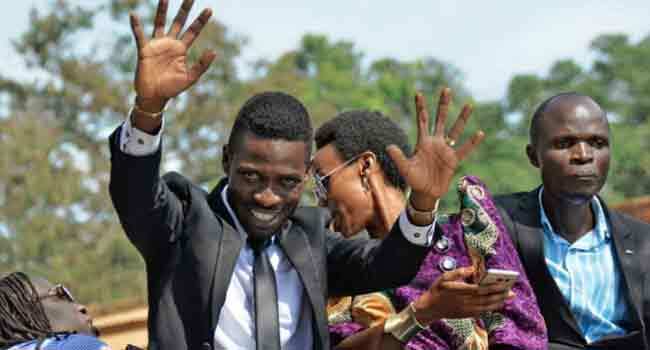 Ugandan singer-turned-politician Robert Kyagulanyi, better known as Bobi Wine, was being held at a government hospital Friday after being rearrested while attempting to seek medical treatment abroad. Kyagulanyi — who faces treason charges alongside 32 others after President Yoweri Museveni’s car window was allegedly broken by a tossed stone — was released on bail on Monday but seized by police Thursday evening at Entebbe airport, outside the capital Kampala. During his bail hearing on Monday, the judge had allowed Kyagulanyi to keep his passport, against the wishes of state prosecutors. Kyagulanyi’s supporters say that he was badly beaten and tortured while in army custody, during and after his arrest in the northwestern town of Arua earlier this month, and requires medical treatment abroad. Opiyo accused authorities of wanting “to create their own medical records” to hide evidence of torture. After his rearrest, Kyagulanyi was taken to Kirrudu General Hospital, a government facility in Kampala. The 36-year-old pop singer entered politics last year and has become a lightning rod for youthful opposition to the long rule of Museveni, 74, who has held power since 1986.